3 Bedroom B&B sleeps 6. £90 PER ROOM PER NIGHT. Excellent pub easy walking distance for evening meals. 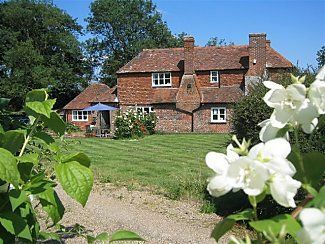 Discover one of Kent’s "hidden places" yet still be within easy reach of many of it's most popular attractions with this friendly family-run Bed & Breakfast. Within minutes of Penshurst Place, Hever Castle, Chartwell and Chiddingstone, it is surrounded by woodland and luscious open countryside providing great opportunities for walkers and visitors to explore this part of the Weald. Guests are free to come and go as they please and have the use of a small sitting room (the old bakehouse, still with it’s original beams and dome-shaped brick bread-oven) plus colour TV for evening relaxation. Breakfasts, cooked on the kitchen Aga, are large and varied with home-made bread and marmalade, and as far as possible, locally sourced and organic. Vegetarian and special diets can generally be catered for provided enough advance notice is given. Hosts Ginny and Nick are relaxed and hospitable and are always happy to answer guests' queries regarding local features and don’t miss the opportunity of coming away with a pot of home-made jam or a piece of Ginny’s hand crafted jewellery as a souvenir! For evening meals, the tiny Greyhound pub, recently awarded CAMRA's 2017 Autumn Award for the Most Highly Commended Pub, is a gentle stroll down the farm drive and has an excellent and reasonably priced menu, and serves locally brewed Larkins beer. There are 3 resident cats and our very quiet and friendly black Labrador, Fen. Visiting dogs can generally be accepted during the summer months provided they are cat friendly and prior notice is given. We offer reduced rates for children under 14 and have a strict no smoking policry throughout. Please note this is a B&B and not a self-catering property. It is our family home and we live here too! There are no guest cooking facilities. Ginny and Nick run a relaxed & easy going family bed & breakfast. Nick is an enthusiastic breakfast chef & enjoys helping guests plan their daytime activities and schedules. Ginny paints whenever time allows and a piece of her home-crafted jewellery or a pot of her home-made jam can make a great souvenir! Breakfast is provided Beds are made for you! The bathrooms all have tiled floors, fully adjustable hot and cold water and heated towel rails. One has a walk in shower enclosure, the other two have a bath with shower attachment. Colour TV available in guest sitting room. Hever and Nizel's golf courses are both within 10 minutes drive. Hildenborough driving range is also 10 minutes away. No courses available but glorious countryside for both painters and walkers! And of course loads beautiful stately homes to visit. Please note there are 4 resident cats (not allowed in bedrooms! ), our beloved friendly and gentle black labrador Fen and the family flock of 14 chickens. Self-catering accommodation for up to 5 people also available. See The Old Stables, Charcott, Tonbridge. The nearest airport is Gatwick which is 40 minutes drive or can be easily reached by train from Penshurst Station which is a 10 minute walk away. Trains run hourly from Penshurst to London (London Bridge) or more frequently from nearby Hildenborough, Sevenoaks or Tonbridge direct to Charing Cross. Penshurst Place. Hever Castle. Chiddingstone, and Chartwell all within 10 -15 minutes drive. Tonbridge, Knole Park, Groombridge Place 20 minutes. Ightham Mote, Squerreys Court, Tunbridge Wells Pantiles 25 minutes. Leeds Castle and Sissinghurst 40 minutes.